Why testimonials are important to your success? You are new a business or brand and you want to get more fresh customers for your thriving business but you would like to know you could effectively compel your website visitors to use your services or products. In this case testimonials makes the choice a lot easier for your clients. Itsolidifies trust between you and your new clients or customers. NFT Testimonials Showcase for Visual Composer is the Wordpress plugin will help you to include testimonials on yourself given by your clients or customers who are satisfied getting your best products or service. Why we made testimonial? When it comes to all businesses (small and big), the success of business depend largely on word of mouth. Testimonials are formal types of expression that help that concept. They are very strong tools when it comes to strengthening your branding. Testimonials power the credibility of you and your business and as you know, people will not deal with your business if they don't believe you and find you to be credible. Impress potential customers One of the strongest things that you can add on your site is detailed customer testimonials. Get recommendations and feedback from your past customers that you can add on your site. This can be showed like a case study, such as how we support a past customer, how we helped a client to succeed, etc. Definitely, this will impress your potential customers. NFT Testimonial Visual Composer Addon Nft visual composer testimonials addon lets you include testimonials blocks your site with different options. This plugin uses CS3 animations. You can also show testimonials with multi color. There are thirteen different perfect themes designs. You can pick any color you want. This addon plugin build to manage and show your testimonials as a dynamic slider or responsive grid. You have multiple unique effects and themes that will help you to present your testimonials in so many different ways. With this Wordpress plugin you can show your testimonials without any code line. All you need to perform is to produce the testimonials picking your wanted options to show. Definitely, picking the best color scheme for your testimonials is never simple, but you can pick easily with this plugin. No doubt, this is one of the most Wordpress plugins in Wordpress, it is developed with Wordpress actions, so developers can change the plugin according to customer requirements. - Beautifully pre-designed 13 themes to select from. - Show testimonials in descending or ascending order. Bootstrap Awesome Testimonials Theme Showcase; HTML5 Responsive FAQ Showcase. Keywords: clients Testimonial, easy plugin to display testimonials, grid testimonials, responsive testimonials plugin, reviews testimonial, testimonial manager, testimonial slider, testimonial visual composer, testimonial visual composer slider add on, testimonials shortcode, testimonials showcase, Unlimited colour testimonials, visual composer addon, word press testimonials plugin. Premium CodeCanyon Testimonials Showcase for Visual Composer add on 20578573 WordPress Themes, Website Templates, Mobile Themes, Flash Templates & Scripts from creative professional designers. Full details of CodeCanyon Testimonials Showcase for Visual Composer add on 20578573 for digital design and education. 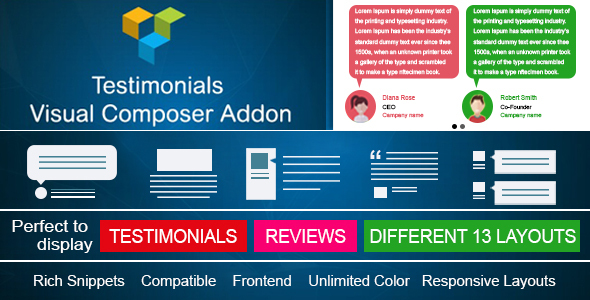 CodeCanyon Testimonials Showcase for Visual Composer add on 20578573 desigen style information or anything related.